A 5 year wedding anniversary should be special and it is quite common to exchange fine jewelry gifts on this day. The first few years of marriage can be the most difficult, but also the most rewarding. It is important to commemorate this first milestone of marriage with a wonderful and meaningful 5 year wedding anniversary gift. Your 5 year wedding anniversary should be a time to reflect on the years that you have spent together as well as celebrate your closeness as a couple. 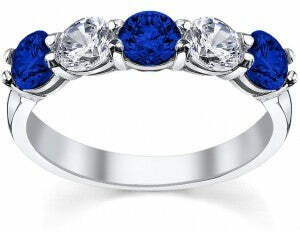 This 5 year wedding anniversary gift features sparkling, white diamonds and blue sapphires. shapes, carat weights, and even setting styles. 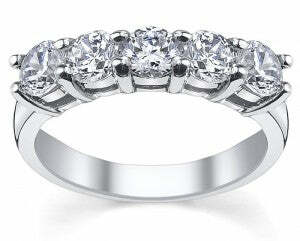 This type of ring would make an appropriate upgrade to a wedding band & can be worn next to an engagement ring. They are stunning when worn on their own as a right hand ring. deBebians offers a wide variety of gifts that will appropriate for your 5 year wedding anniversary. We also offer a loose diamond search that features GIA diamonds and EGL diamonds. If you would like assistance in selecting the perfect gift for your loved one that is also perfect for your budget, we have GIA graduate gemologists available to assist you.